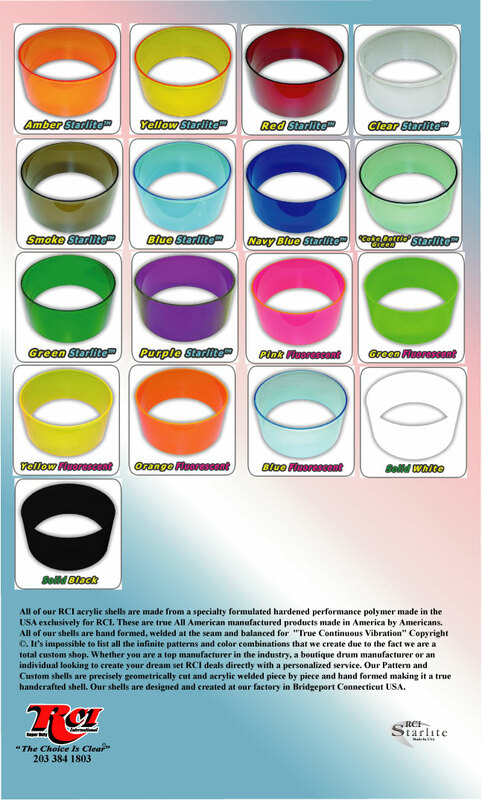 Manufactured by RCI International, hardened acrylic polymer engineered by RCI and made in the USA . *All seams are acrylic welded and sealed (Engineered at RCI International Patent Pending) . *These shells do not have a support tab or thin strip of plastic holding the seam together. *The RCI Starlite shells stand second to none due to the fact they are made for the percussion industry. *RCI Starlite shells (Solid transparent colors, or Pattern colors) are "acrylic welded" at the seams thus making them air and water proof. RCI Starlite acrylic welded, sealed shell and the competitors (identified by a Support Tab holding the seam together.) were sent to an Acoustic Vibration Specialist, the RCI shell being the obvious victor. *With RCI Starlite, vibration passes through the entire shell giving it the utmost in acoustic tonal qualities. *"Top, mid, and bottom end tonal qualities suffered due to the competitors "Support Tab" shell design. All vibration went to the weakest part of the shell..........the seam. *The best drum builders know; ...top end tuning is crucial to a sealed shell, ..air should be controlled through the venting..
*RCI Starlite Acrylic Shells are the # 1 shell used by the Largest and Most Reputable Drum Companies in the World today.